We recommend the Optimum Power Clean or the 3D Grand Slam as an alternative. If you want a really strong degreaser even after you dilute down the product, this is the product for you. It quickly deep cleans your vehicle's engine bay, tires and exterior. The Meguiar's Super Degreaser should be diluted down 10:1 (water:cleaner) for normal build ups and dilute it down 4:1 (water:cleaner) for really heavy or stubborn builds ups that can't be removed initially. Even though the formula is strong, it still is VOC compliant and comes with a great scent so it's safe to use. It should be used with care on any new surface you have not previously used it on. We recommend misting it on the affected area and rinse it off after roughly 30 seconds to ensure you are getting the desired results. Be careful that you don't leave it on the surface for too long or in direct sun, you should never let the product dry on the surface. After you are done, it will rinse completely clean and not leave any white haze behind. This professional strength cleaner can help you quickly clean the engine bay, wheel wells, tires, dirty panels, and more, without having to scrub each surface and waste time. 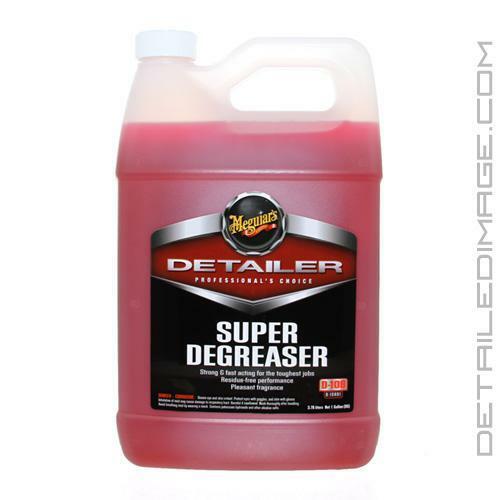 The Super Degreaser is from the Meguiar's Professional Detailer Brand, which offers tremendous value and a highly effective formula that every detailer can appreciate. If you want the most effective cleaner on the market then look no further than the Meguiar's Super Degreaser. Pair with the Meguiar's Super Degreaser Bottle (D108) and the DI Accessories Chemical Resistant Spray Trigger for easy dilution, storage, and usage! Meguiar's Super Degreaser is an extremely concentrated formula that is effective on wheels, tires, wheel wells, engine bays, and other contaminated surfaces. With this concentrated formula you can dilute 4:1 (water/product) for heavy cleaning or 10:1 (water/product) for mild cleaning. Talk about a money saver! 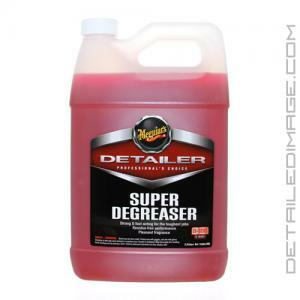 "SUPER DEGREASER Super Degreaser exceeds expectations by quickly breaking down even the toughest grease. Its fast acting, free rinsing formula prevents unsightly white residue stains while its herbal fragrance creates a pleasant work environment." Dilute to required specifications and apply to desired surface. Let sit for 30-45 seconds and thoroughly rinse clean with water. Do not let dry on surfaces. TIRE CLEANING: Prior to use, ensure surfaces are cool to the touch by spraying with cold water. PROFESSIONAL TIPS: For severe grease accumulations, agitate with brush. To prevent any accidental staining from over spray when degreasing engines, wet adjacent panels with diluted Meguiar's Hyper-Wash or Shampoo Plus prior to application. Great product, great pricing, very versatile. No cons. Put this in the arsenal to clean tires, doorjambs, engines and works like a charm. 1gallon makes 5gallons! As a professional this is the only degreaser I buy. Works extremely well at both dilutions, and is very economical. 10:1 for light cleaning and 4:1 for dirtier jobs.